The #1 Reason For Going With Synthetic Grass - Lawn Kings Inc. The answer for why homeowners and organizations purchase synthetic grass or artificial turf, can be given in several one-word responses, in most cases. Like everything in life, it seems some things can be reduced to a one word reply as to why; we have done something, started something, why we completed something, or why we’ve made a certain decision. The reasoning behind these decisions can be very involved and maybe even a little convoluted particularly for big life decisions. Turf usually does not qualify as that type of decision. Yet purchasing synthetic grass and selecting a high-quality installer still requires your time to think it through, since there are several product options available and it may not necessarily be a very large expense, but a quality synthetic grass installation isn’t inexpensive either. Like most homeowners and organizations, we think to use a one-word description, you just want it done, “right”. This likely means; the right synthetic grass, the right, installation, the right price, the right communication & customer service, the right warranty, etc. 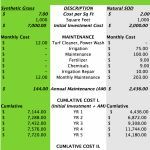 Hope you don’t mind this post will meander some before providing an explanation and answer as to what, in our opinion is the #1 reason for choosing synthetic grass by homeowners and organizations. As you’ve probably ascertained already the purpose of this article is our humble attempt to educate you or a least have you consider some of the reasons homeowners and organizations purchase and install synthetic grass. As you might imagine, depending on the organization, homeowner and their yard and family situation, or how the turf will be used, the reasons for selecting synthetic grass below may actually be the #1 reason for the individual homeowners and organizations too. Of course, it could very well be the case also that it is a combination of reasons that lead the purchaser to select synthetic grass. Lower Water Bill – from significant water conservation. 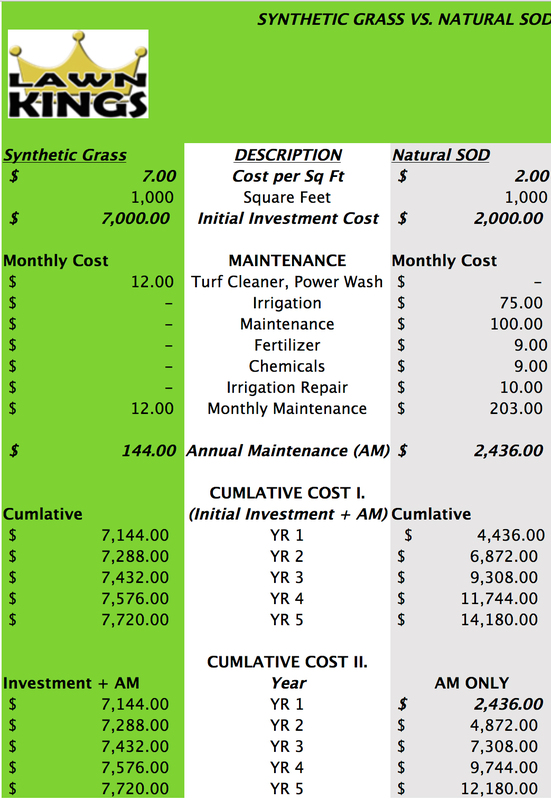 Save Money – landscaper(s) for the Synthetic Grass – no longer required. No Pesticides / No Fertilizers – not required, saves money and reduces ground pollution. No More; Lawn Diseases, Weeds, Pests, Rodents, & Muddy Puddles – good looking grass year-round without insects & critters! Just have to mention – no dead spots. Synthetic Grass looks gorgeous compared to; Decomposed Granite (DG), Decorative Rock, and Desert Landscaping (most) and it is functional meaning kids (and adults) can play on it. Financial – synthetic grass can return the initial investment in about four years or less depending on the region of the country. As mentioned above the basis for purchasing grass for everyone we’ve sold and installed turf for may not be the reason you might make the decision. So, the answer here is an informed opinion and based on our experience and not a formal scientific survey with our customer base or from the industry itself. Nevertheless, we have been in the industry for some time now and have met with and sold turf to many people and organizations. Initially our primary focus in explaining the benefits of synthetic were all about Water Conservation due to the various droughts we’re seem to perpetually be in. This resonated well with many homeowners and organizations. These synthetic grass customers were very aware that they were taking an active part in the green economy and involved in sustainable development – being “green” is a good thing. Over time we had several experiences selling synthetic grass to people in Oregon and Washington. Initially puzzled because natural sod grows easily in those climes. We listened carefully and soon learned that some homeowners were tired of having to care for their lawns. We also researched and learned a few things too from these customers as well as those in Southern California. In short, in our experience the paramount reason (but of course not the only reason) people make the decision to purchase synthetic grass is to avoid and eliminate the time and expense to care for the lawn. So, in other words, there’s a certain amount of freedom that comes along with a high-quality synthetic turf installation. This is true for residential as well as commercial applications. The answer or word we’d put on it is simply MAINTENANCE or better yet the phrase Virtually Maintenance Free, this is the #1 reason, in our experience homeowners and organizations have synthetic grass installed. There are some things to do to maintain synthetic grass of course but very little. If you’d like to know more about how to maintain synthetic grass (not much to do) we’d be happy to email a FREE copy of our Lawn Kings – Synthetic Turf Maintenance & Care, guide. We also offer FREE ESTIMATES.